Holy Cross Parish sponsors 7 monthly meals at the Samaritan Center. Volunteer teams of 15 or more individuals & families prepare, serve & clean up after the meal on Sunday afternoon. Families with young children are invited to help with an hour of meal prep at 11:30am. You are invited to sign up for meal prep at 11:30am or to serve & clean up at 12:30-3:30pm. Contact Coordinator Rick Coughlin: ‭(315) 446-2610‬ or philiprcoughlin@gmail.com to sign up for March 10th, or for April 7, Sept. 22, Oct. 20 or Nov. 17, 2019. Thank you for the Baby Gifts! Thank you parishioners and to elementary faith formation families for the generous baby gift donations! Your baby gifts will benefit local agencies who care for women & children suffering in poverty: Catholic Charities, Birthright and Joseph’s House. And thank you to our families that helped package and sort gifts after Mass last Sunday. Neighbors Helping Neighbors: Help is available! Holy Cross maintains an email list of volunteers who are willing to help in a pinch. If you have a one-time or short-term need, such as a meal after surgery, help clearing snow or a light household chore, contact Beth: 315-416-4576. 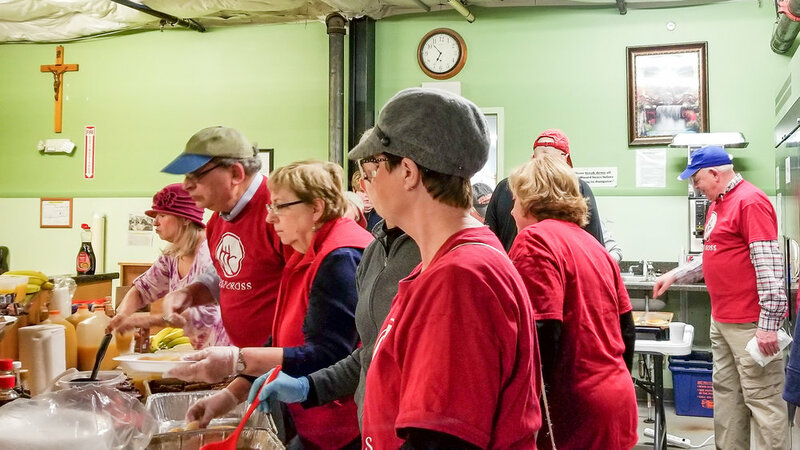 Thirteen volunteers arrived before dawn at Catholic Charities Men’s Shelter on Sunday morning to serve a hot pancake breakfast to the 100 men who stayed overnight. Thank you to all who attended and to parishioners who donated food & money to support our men’s shelter ministry! The Refugee Assistance Committee held an American-style “birthday party” for the children of our befriended refugee family. Birthday parties are not part of their culture, but the children were delighted with the event! The party included cake, candles and party hats & presents. To join the Refugee Assistance Committee, contact Beth (beth@holycrossdewitt.org).